Nanophthalmos is characterized by bilateral and symmetrical small eyes with shortened axial length of 20 mm or less (two standard deviation below average axial length), high lens-to-eye volume ratio with shallow anterior chamber, enophthalmos, and narrow palpebral fissures. 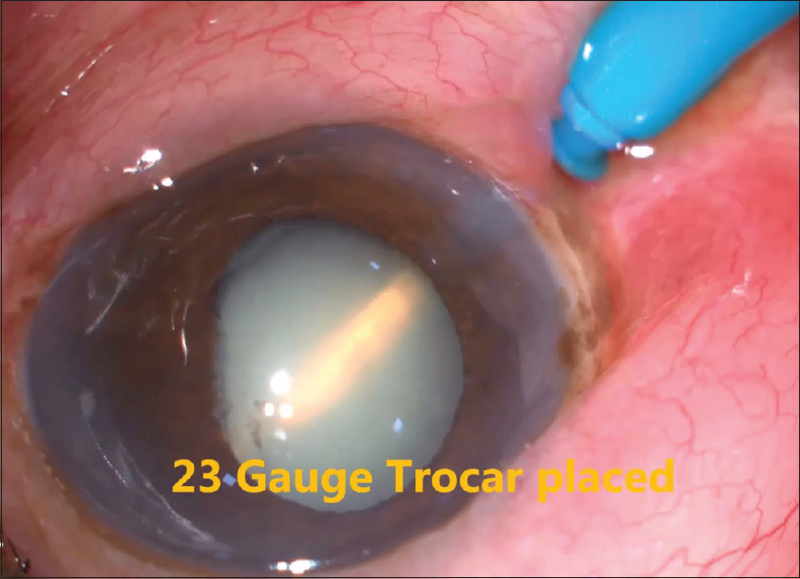 All these features make it challenging for cataract surgery, in this case report, we suggest few necessary steps taken for an uncomplicated outcome. Nanophthalmos refers to an eyeball of short axial length, usually less than 20 mm. Cataract surgery in a nanophthalmic eye is technically challenging with high risk of complications such as posterior capsular rupture, uveal effusion, choroidal hemorrhage, vitreous hemorrhage, malignant glaucoma and retinal detachment., Cataract surgery requires meticulous planning that is imperative to an uncomplicated outcome. A 56-year-old man presented with the complaint of decreased vision in both eyes for 6 months and a history of wearing thick glasses for 10 years. On examination, he had small eyes and vision of 3/60 in the right eye and counting fingers close to face in the left eye. On slit-lamp examination, both eyes had shallow anterior chamber (AC), posterior synechiea was present, and Nd:Yag peripheral iridectomy was done. The patient had Grade 2 nuclear sclerosis in both eyes with moderately dilated pupil, fundus features were hazily made out. Intraocular pressure was 12 mmHg by Goldmann applanation tonometry and gonioscopy showed appositional angle closure in both eyes. The patient was planned for cataract surgery of the left eye followed by right eye. Routine cataract workup was done. Anterior-segment (AS)-optical coherence tomography (OCT) showed narrow angles and AC depth (ACD) of 1.43 mm in both eyes. Biometry was done using IOLMaster ®. Biometry findings are summarized in [Table 1]. Intraocular lens (IOL) power calculation was done using formula SRK-T using immersion and optical biometry. The patient underwent left eye phacoemulsification under local anesthesia. Prophylactic anterior lamellar sclerotomy was done superonasally to avoid suprachoroidal hemorrhage, a known complication in nanophthalmic eye [Figure 1]. 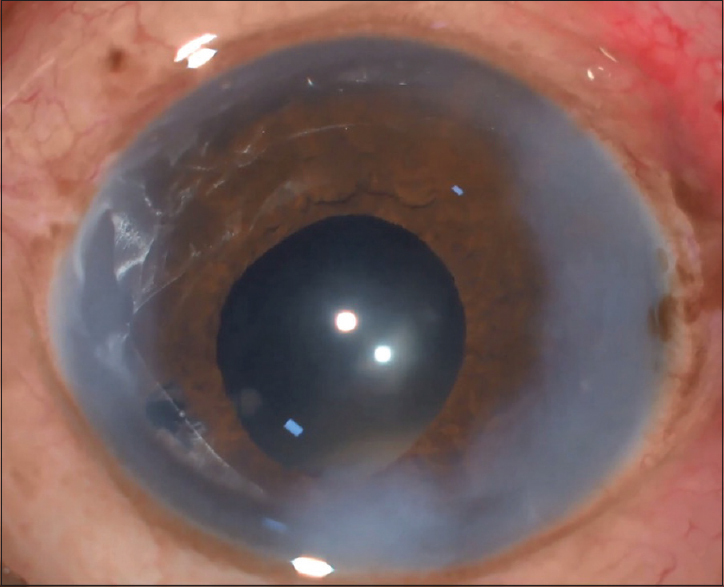 After releasing peripheral synechiea, superior clear corneal phacoemulsification was done using stop and chop technique. Though the nucleus management was uneventful, during surgery, due to shallow AC, we found it difficult in maneuvering the instruments. A custom-made single-piece hydrophobic acrylic IOL of +37 D which had thicker optic was gently implanted in the bag [Figure 2]. Peripheral iridectomy was enlarged using 23G vitrectomy cutter, postoperative period was uneventful. Right eye phacoemulsification was done under local anesthesia 1 week later. To overcome the difficulty faced in other eye, we decided to perform 23G pars plana vitrectomy to help deepen the AC for easy maneuvering; it also helps in avoiding suprachoroidal hemorrhage complication [Figure 3]. Similar to the other eye, initially, posterior synechiea was released and routine phaco stop and chop technique was used. This time, we found it easy in maneuvering during surgery and cataractous lens was easily emulsified. Custom-made 40 D IOL was implanted; peripheral iridectomy was enlarged using vitrectomy cutter [Figure 4]. The intraoperative and postoperative period was uneventful [Figure 5]. 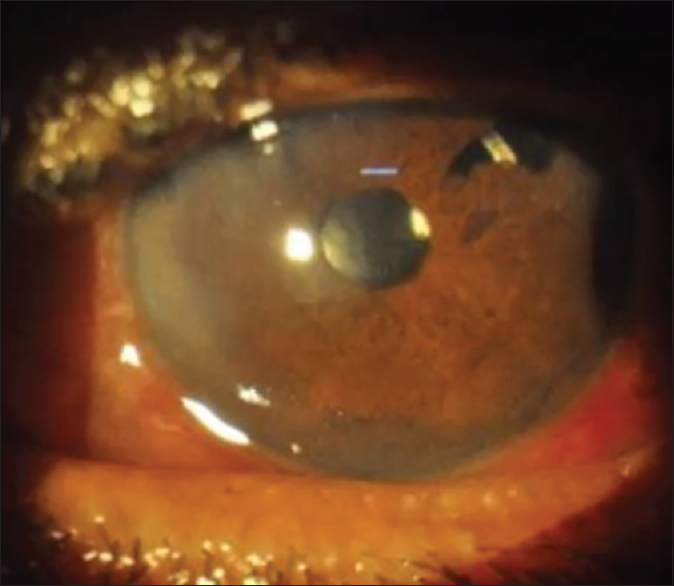 Cataract surgery in a nanophthalmic eye is technically challenging with high-risk intra- and post- operative complications. Through preoperative assessment, meticulous intraoperative management and watchful postoperative period gives better outcome. Thorough slit-lamp examination, angle study to look for angle closure, AS-OCT to measure ACD, ultrasound B-scan to measure scleral thickness and rule out choroidal effusion, and accurate biometry to confirm IOL power help in coming up with plan to tackle intraoperative challenges., Preoperative intravenous injection of 20% mannitol 15–20 min before surgery dehydrates vitreous and helps to deepen AC. AC depth of <2 mm may lead difficulty in capsulorhexis, endothelial less loss, iris prolapse, and posterior capsular rupture (PCR). Use of high-density viscoelastics helps to deepen and stable AC, along concurrent use of dispersive viscoelastics to protect the endothelium. Bottle height should be raised to maintain AC during surgery and phaco energy should be minimum to avoid endothelial loss. Since IOL used has thicker optics, gentle insertion and manipulation help to avoid PCR. Anterior lamellar sclerotomy helps in case of suprachoroidal hemorrhage in encountered. The novel method to avoid positive pressure is to do limited pars plana vitrectomy as shown in the second case. 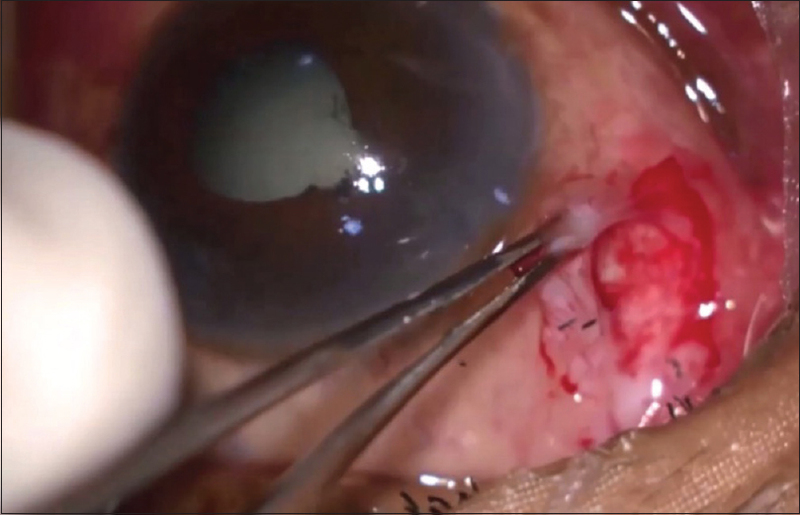 Prophylactic surgical iridectomy relieves pupillary block and avoids postoperative rise in IOP. Apart from regular postoperative complication of any cataract surgery, nanophthalmic eyes have higher risk of malignant glaucoma; pars plana vitrectomy during primary cataract surgery helps to avoid suprachoroidal hemorrhage., Anterior uveitis can be managed with topical and oral corticosteroids. Wu W, Dawson DG, Sugar A, Elner SG, Meyer KA, McKey JB, et al. 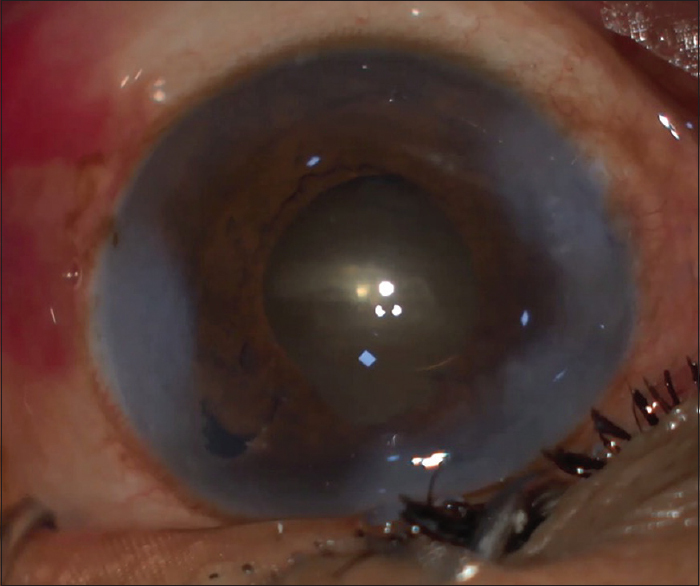 Cataract surgery in patients with nanophthalmos: Results and complications. J Cataract Refract Surg 2004;30:584-90. Duke-Elder S. Anomalies in the size of the eye. In: Duke-Elder S, editor. System of Ophthalmology. St. Louis, MO: Mosby Year Book; 1963. p. 488-95. Singh OS, Simmons RJ, Brockhurst RJ, Trempe CL. Nanophthalmos: A perspective on identification and therapy. Ophthalmology 1982;89:1006-12. Steijns D, Bijlsma WR, Van der Lelij A. Cataract surgery in patients with nanophthalmos. Ophthalmology 2013;120:266-70. Jung KI, Yang JW, Lee YC, Kim SY. Cataract surgery in eyes with nanophthalmos and relative anterior microphthalmos. Am J Ophthalmol 2012;153:1161-80.